2005 Scandinavian Film Festival L.A.
Scandinavian Film Festival L.A., sponsored by ASFLA, comes to the Writers Guild Theater on Fri., Sat. and Sun., Jan. 14, 15, and 16, 2005. The sixth annual showcase of Nordic films and filmmakers, launched in 2000, screens the year's Scandinavian films submitted to the Academy as nominees for Best Foreign-Language Film. It also screens documentaries, short subjects and other pictures by Scandinavian filmmakers. Non-competitive, the festival gives Southern California audiences an opportunity to see the best in contemporary film from Denmark, Finland, Iceland, Norway and Sweden. Scandinavian Film Festival L.A. is underwritten by ASFLA, with Danzka Vodka, Scandinavian consulates, and generous support of national film organizations, individuals and corporate donors. Donors receive festival admission, listing in the program, and an invitation to an exclusive after-party at a Scandinavian consulate. To become a sponsor, call (323)661-4273 or email ASFLA. Download and print a 2005 festival schedule and ticket order form, in pdf format. Complete the form and save, then fax, mail or email it with your payment. See "How to Order Tickets," below, for prices and payment information. 8 p.m. HAWAI'I, OSLO,* Norway 2004, 125 min. Erik Poppe. A handful of people cross each other's paths, without necessarily meeting one another, during the hottest day of the year in Oslo. Frode and Milla are having their first child, whom they are told won't live long. Bobbie-Pop is a faded singer who tries to commit suicide. Leon is an institutionalized kleptomaniac looking for a woman with whom he has a 10-year-old deal to wed. Leon's brother fetches him from the institution to celebrate Leon's birthday, but Leon plans to use it as a chance to escape. Finally, Leon's best buddy at the institution, who sees things no one else can see, may be able to save everyone but himself. Advance reservation encouraged, though not required; screening followed by champagne dessert table and ASFLA reception sponsored by Danzka Vodka. 12 noon COLD LIGHT (Kaldalj�s),* Iceland 2004, 91 min. Hilmar Oddsson. A warm story painted by chilling clairvoyance. What could be better than knowing your future? And what could be worse? A love-filled childhood abruptly ends when catastrophe descends -- one that the child foresaw, yet failed to act upon. Now a 40-year-old man hides in a self-made prison of mundane life. The film opens as he finally becomes resolved to gaze at, and come to terms with, an entirely different life -- his own unthinkable past. He sheds the cobwebs turbulently to discover that light and happiness have been awaiting him. This potentially cold cinematic knock on life's door becomes a defiantly uplifting work of art. 2 p.m. PRODUCING ADULTS (Lapsia Ja Aikuisia),* Finland 2004, 104 min. Aleksi Salmenper�. A stirring film about people standing at the brink of adulthood. Venla works as a psychologist at a fertility clinic and dreams of having a child with her long-term boyfriend Antero. When his secret vasectomy reduces her options, her mind turns to the storeroom at work, housing millions of sperm samples lying dormant in liquid nitrogen. He is tall with brown hair and blue eyes -- that�s all she knows about the future father. Her dreams of creating an ordinary family life crumble when a sympathetic female doctor agrees to help her -- and romantic symptoms blossom. 5 p.m. THE FIVE OBSTRUCTIONS (De Fem Bensp�nd),* Denmark/documentary 2003, 90 min. J�rgen Leth, Lars von Trier. In 2000, Lars von Trier gave an assignment to his hero, the great Danish filmmaker J�rgen Leth. Together they would watch and discuss Leth's 1968 short THE PERFECT HUMAN -- "a little gem that we are going to ruin," smirks von Trier. Leth then would set out to remake his own film five times, with von Trier imposing a series of obstructions on each remake. Some of these are formal limitations (shots in the first film can be no longer than 12 frames), while others assume moral, personal or even metaphysical intonations. Leth proves to be a wily opponent. The meetings between the two masters, with Leth reporting back to von Trier, are studies in self-concealment -- and frequently funny. 6:30 p.m. AS IT IS IN HEAVEN (S� Som I Himmelen),* Sweden 2004, 130 min. Kay Pollak. A famed conductor tours the world hoping to create music that will open people's hearts. His own heart, however, is in bad shape. In fact, he suffers a heart attack onstage. Afterward he bids the music world farewell, returns to his hometown and buys an old, empty schoolhouse, where he hopes to live a quiet life. At first, he isn't recognized in the little village, because he's changed his last name. But a local minister discovers the world-famous conductor and asks him to work with the church choir. The choir improves, singing a successful local concert, and gets accepted to an Austrian competition. But tensions created by the conductor's presence have romantic, and tragic, side effects. 9 p.m. HONEY BABY (Hani Beibi), Finland 2003, 106 min. Mika Kaurism�ki. A magical mystery tour that retells the Greek myth of Orpheus and Eurydice. Tom (Orpheus) is an American songwriter and musician who, after many years on the road, lands in Germany. Stuck in Europe and overlooked by fame, the musician will do almost anything to get home. Tom agrees to tour backwater Russian towns playing his melancholy acoustic ballads, however. His fatal decision to accept this one last tour lands him in hot water with cold-blooded Russian mafia. It also triggers an amorous adventure with the stunning but messed-up Natascha (Eurydice), a Russian who's come to Germany to marry wealthy businessman Karl (Aristaios), and who leaves Karl at the altar. 12 noon POPULAR MUSIC (Popul��rimusiikkia Vittulaj�nk�ll�), Sweden 2004, 120 min. Reza Bagher. About living as Finnish minority in Swedish Lapland in the mid 1960s. Matti and Niila grew up in the harsh and conservative environment of a Finnish-speaking part of Sweden, near the Finnish border. Their big dream was to become rock stars. Eventually the friends went their separate ways. Matti became interested in girls and let down Niila and the band -- a transgression that Niila never forgave. In the present, the now grown-up Matti feels guilty about the death of his drug-addicted rock-star friend, Niila. Matti, who still lives in his old hometown in Sweden, carries Niila�s urn to the top of a Himalayan mountain, where Niila finally teaches Matti an important life lesson: if you are brave enough, and follow your heart, you eventually will reach the top. 2:15 p.m. NICELAND (N�sland), Iceland 2004, 87 min. Fridrik Th�r Fridriksson. Focuses on two defiantly innocent, rather addle-pated lovers, Jed and Chloe. Their affair suffers a seemingly insurmountable setback, which leaves Chloe without a reason to live. Determined to marry her, Jed sets out to discover the meaning of life. It seems an impossible task until he sees Max -- a junk collector who professes to hold the secret to existence -- on television. Despite the objections of his TV-obsessed parents, John and Mary (for whom the loss of cable is an almost inconsolable tragedy), Jed goes to the junkyard. Instead of discovering the meaning of life, however, he finds a crazed, near-suicidal man with serious problems. Undaunted, Jed camps out in the scrapyard, determined to solve his riddle before Chloe slips further into depression. 4 p.m. MY JEALOUS BARBER (Min Misunnelige Fris�r), Norway 2004, 90 min. Annette Sjursen. Bent has gotten his hair cut at Frank's barbershop for ten years. Faithfully, he brings his father's dinner every day, and never misses work. He lives a stable and predictable life until Susuie moves into the neighborhood with her aroma-therapy practice. Frank the barber is suspicious of Susuie because she's moved around a lot, and has a bad memory. Despite Frank's warnings, and the fact that Susuie never remembers men she falls in love with, Bent is smitten and decides to make some changes in his life. He changes barbers. 6 p.m. AFTERMATH (Lad De Sm� B�rn), Denmark 2004, 104 min. Paprika Steen. "How does one bear the unbearable?" This is the question asked by Claes and Britt, a couple in their mid-30s who lost their only child in a car accident. Now they struggle to overcome their grief. Britt can't talk about it; Claes can't talk about anything else. Britt buries herself in her social-work job, becoming involved with a single mother and her baby, exceeding the bounds of professional interest. Claes is unable to function at work and is sent home on leave. He doesn't tell Britt, but spends his days stalking the woman who ran over their daughter. When Britt clashes with the mother, and Claes confronts the woman, it's clear that revenge cannot conquer grief. 8 p.m. THE DOG NAIL CLIPPER (Koirankynnen Leikkaaja), Finland 2004, 104 min. Markku P�l�nen. Mertsi, an idealist, volunteers for a war and returns home crippled. His overwhelming idealism transforms itself into a small act -- clipping dogs' nails -- that becomes an obsession until he fails. Mertsi arrives at a house owned by Kuosmanen, bearing a work order to clip the nails of Kuosmanen's dog, which Kuosmanen wrote as a joke. But Mertsi fails when the dog bites his wrist, and he leaves the dog's nails untrimmed. Mertsi's endeavor is waylaid when his hand becomes infected. Goodness triumphs, however, when Mertsi meets the doctor who treated him in the war, and waves his white-bandaged hand as if to say: "The world may bite, but life goes on!" Screening followed by ASFLA closing party at 10 p.m.
* Submitted to the Academy Awards for consideration as an Oscar� nominee in the Best Foreign-Language Film category. Between screenings on Sat., Jan. 15, and Sun., Jan. 16, you're invited to network and nosh at the Nordic Caf� in the theater lobby, where you'll enjoy refreshments and the good company of others who share a love for Scandinavian film and Hollywood. $75 - VIP Pass; includes Take Six Opening Gala buffet, champagne dessert table and pass to all festival screenings. Advance reservation is required by Jan. 13, 2005. $40 - Take Six Opening Gala buffet, screening and champagne dessert table -- one-night only (Jan. 14). Advance reservation is required by Jan. 13, 2005. $15 - Opening night film-screening only and post-screening champagne dessert table sponsored by Danzka Vodka (Jan. 14) -- opening gala buffet is not included. Advance reservation recommended, through not required. $10 - Individual screenings on Jan. 15 and 16. Tickets are on-sale at the door as available, though reservations are encouraged. Short-subject screenings are gratis with the purchase of respective, accompanying feature-film admission. Gratis - Academy members with ID, and full-time students with valid ID documenting current semester's enrollment at accredited college or university, are invited to attend screenings-only at no charge, except for the opening-night screening (Jan. 14), which is $15 and includes the champagne dessert table. Guild and Academy members, and students attending the Take Six Opening Gala buffet (Jan. 14) are obliged to pay the full, respective price. Advance reservation is required by Jan. 13, 2005. For those attending only the screening and champagne dessert table, advance reservation is encouraged though not required. Click here to download and print a festival schedule and order form in pdf format. Complete the form and save, then fax, mail or email it with your payment. � Click on the PayPal button below. Enter your total amount, click "Continue," then enter in the "Message to Seller" field a detailed itemization of your order, plus your phone number. Note: There is no shipping; please pick up your ticket(s) at will-call. � Email your order to Scandinavian Film Festival L.A. Box Office. � Fax your order to (323)661-4273. � Mail your order to Scandinavian Film Festival L.A; P.O. Box 292329; Los Angeles, CA 90029. � Call the film festival box office at (323)661-4273. Please send your order for the Take Six Opening Gala buffet, screening and champagne dessert table (Jan. 14) so that the box office receives it no later than Jan. 13, 2005. Note: there is no shipping. All tickets and passes are held at the festival box office until the date of the event, reserved under the name of the individual who placed the order. Please pick up tickets and passes at the will-call line upon arrival. Be prepared to show identification. Scandinavian Film Festival L.A. is underwritten by American-Scandinavian Foundation of Los Angeles in conjunction with Danzka Vodka, the consulates of Denmark, Finland, Iceland, Norway and Sweden, with the generous support of national film organizations, individuals and corporate donors. Now in its sixth year, Scandinavian Film Festival L.A. offers a Nordic visibility and voice in the Oscar race. Attracting audiences that are part Southland film afficionados, part film professionals, and part homesick Nordic folk anxious to see something new from home, "The festival takes people North to see who might be the next Bergman, or receive one of the coveted Best Foreign-Language Film nominations," said festival founder/director Jim Koenig. All five Scandinavian consulates enthusiastically hail the event as an important part of the arts scene in Los Angeles as well as a boon to cultural exchange between the U.S. and Nordic countries. Funding for the event is dependent on individual and corporate donors, the consulates, and the Nordic film institutes. The festival was launched in Feb. 2000 with the Danish Film Institute as the primary sponsor. Donors receive festival admission, listing in the program, and an invitation to an exclusive after-party at a Scandinavian consulate. If you'd like to become an individual or corporate sponsor please contact ASFLA, or call (323)661-4273, to express your interest in making your tax-deductible gift. Click on the PayPal button below and automatically make reservations now. 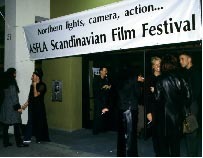 American-Scandinavian Foundation of Los Angeles (ASFLA), due to circumstances beyond its control, reserves the right to change screenings and schedule without prior written notice.